The present study was undertaken to develop a protocol for acquisition and analysis of images of ghee samples to derive mathematical parameters related to adulteration of cow ghee with vegetable fat and to develop a model to predict the adulteration levels. The images acquired using a flatbed scanner were quantified in terms of their pixel intensity, colour, morphological, textural and skeleton parameters using ImageJ software. The selected parameters were measured for images of pure cow ghee and compared with that obtained for ghee adulterated with 5%, 10%, 15% and 20% vegetable fat. The parameters were assessed for their ability to detect the fixed adulteration levels on a discrete scale was assessed using discriminant analysis and the adulteration levels of the samples were correctly classified to the extent of 92.2%. 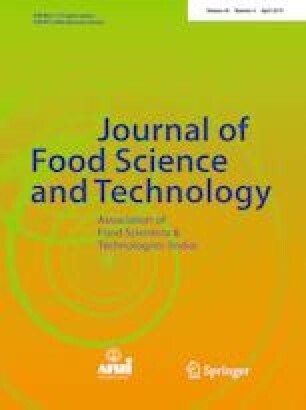 An equation for predicting adulteration levels on a continuous scale using regression analysis (adjusted R2 value 0.94) was developed, tested and further validated using a fresh data set including a commercially popular market sample of ghee giving a good fit (R2 value of 0.85). The online version of this article ( https://doi.org/10.1007/s13197-019-03677-x) contains supplementary material, which is available to authorized users. The work was done at Southern Regional Station, ICAR-National Dairy Research Institute, Bengaluru. The support of Maharashtra Animal and Fishery Sciences University, Nagpur to first author is gratefully acknowledged.